Italy has spoiled me over the years. There’s probably no country I’ve traveled more in its entirety, including my own! Which is not as crazy as it sounds considering the boot landmass is roughly the size of California. When I was studying abroad in Rome, my program took weekend trips to all the major landmarks. 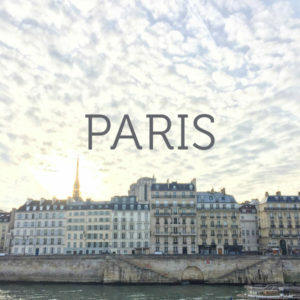 But there was part of me that felt I wasn’t truly getting to see the country from the inside of a luxury tour bus careening down a sterile Autostrada, or through the thick glass of a train window. Ever since, I’ve been lusting for a true Italian road trip. With pit stops at wineries, roadside markets, and hilltop towns so quaint and narrow your car may never make it out. So when Charlie gifted me the generous gift of a road trip in Switzerland and Italy, I immediately jumped for joy, nixed the Switzerland part, and began planning our epic summer sojourn through the hills of Tuscany. In retrospect, it being August, the original itinerary might have been preferable for combating the summer heat. 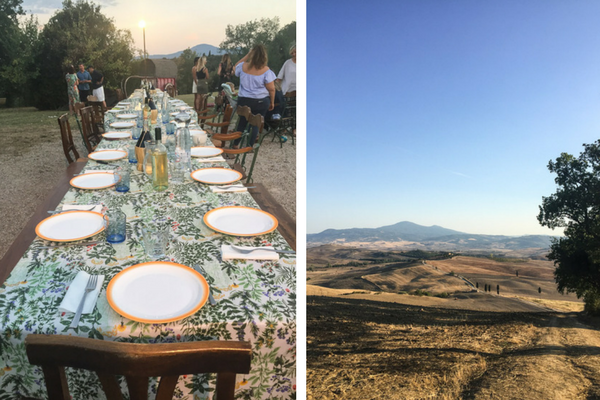 We arrived right on the toes of an epic 100+ heatwave, but even after the worst of it had let up, our days in the heart of Tuscany were mostly spent driving, eating and fighting off mosquitos during our indoor siestas due to the oppressive temperatures. So my first piece of advice for visiting Tuscany is try not to do so in August. May, June, September and October are the best months. The further away from peak tourism and the heat, the better. Of course, an Italian summer road trip would not have been complete without some respite by the water. To balance out our time baking under the Tuscan sun, we sandwiched (panino-ed?) our Pienza leg between two stretches of time on the coast. To avoid the more touristy areas, we chose two towns that were refuges for city locals. 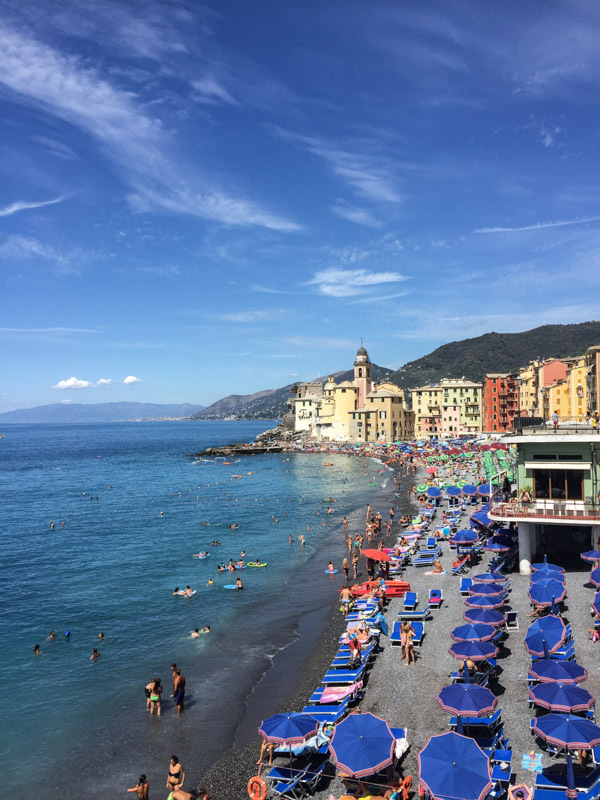 The first stop was Camogli on the northwest coast, about 3 hours from Milan, and just a stone’s throw from the more traveled hubs of Portofino and Cinque Terre. This was the only stop besides Rome outside of Tuscany, but since it was cheaper to fly direct from New York into Milan, we started in this area of Genoa. Also, we did it for the pesto. 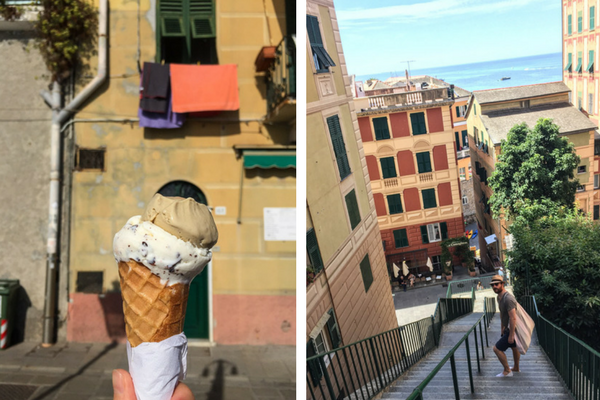 Since the rest of this road trip guide focuses on Tuscany, I want to drive home (pun intended) the fact that Camogli is worth a detour. We absolutely loved everything we ate and saw on this little strip of coast. And we didn’t overhear a single American while there. The second half of the sandwich, further to the south was Porto Ercole, a chic town on the island-like land mass of Monte Argentario. 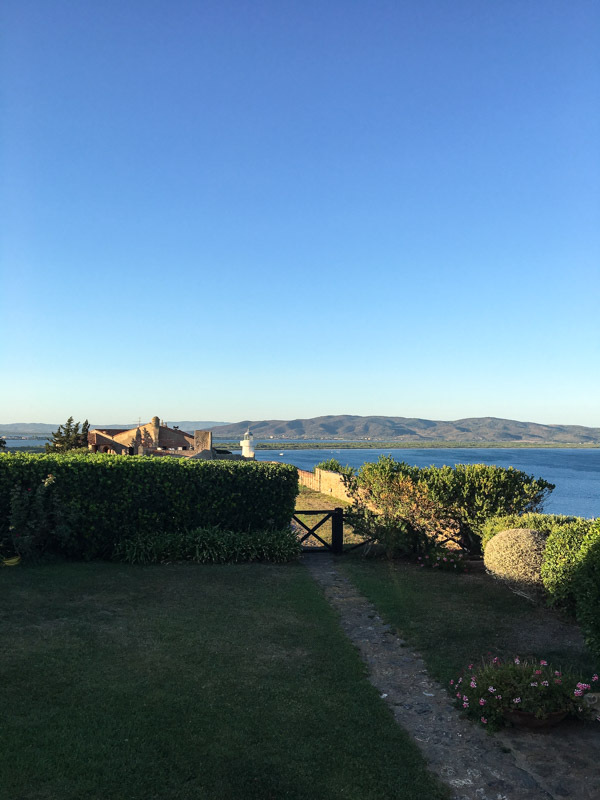 Most people don’t realize that Tuscany stretches all the way to the coast, and besides the expensive resort Il Pellicano, the area remains mostly undiscovered to non-Italians. That said, our favorite 24 hours of the trip was shared with about 40,000 people in the central piazza of Siena. 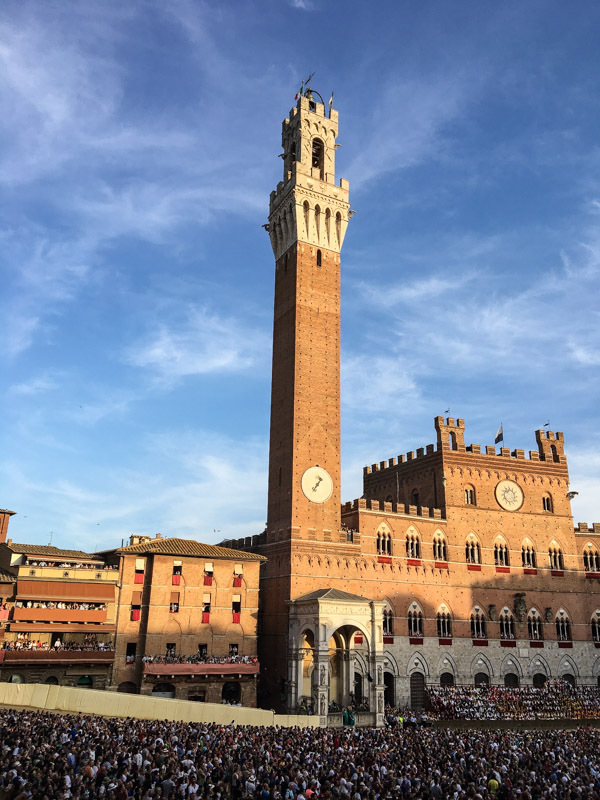 When I found out that part of our Tuscany trip would overlap with the Palio, Siena’s famous horserace in Piazza del Campo, we immediately threw our budget out the window and bought balcony seats in the square. 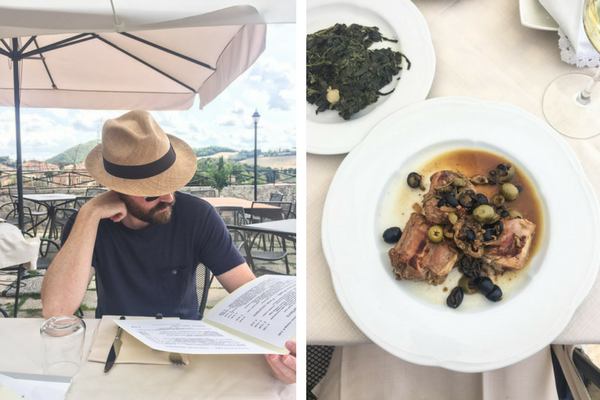 As for the rest of the must do’s, see’s and eats, read on for my favorite restaurants and places to stay in Tuscany. There are notes on how to get gluten-free fare at all these places. You won’t go home hungry, that’s for sure. 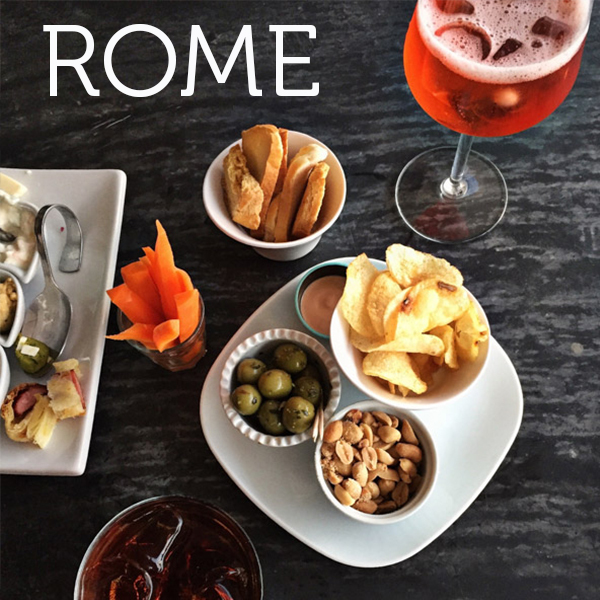 As I mentioned in my Rome recap, Italy was one of the most celiac-friendly places I’ve ever been. 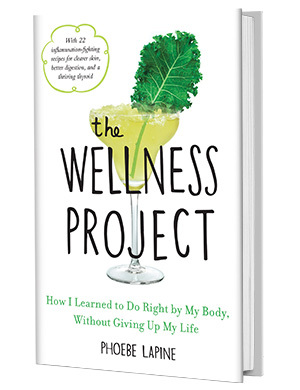 But if you’re worried about communicating your dietary restrictions, my friend Jodi has a fabulous gluten-free dining card that you can download from her website. The first leg of our trip was in Genoa, NOT Tuscany. But I’ve included it here because we absolutely loved this section of the country and highly recommend deviating slightly Northwest to add it to your travels. 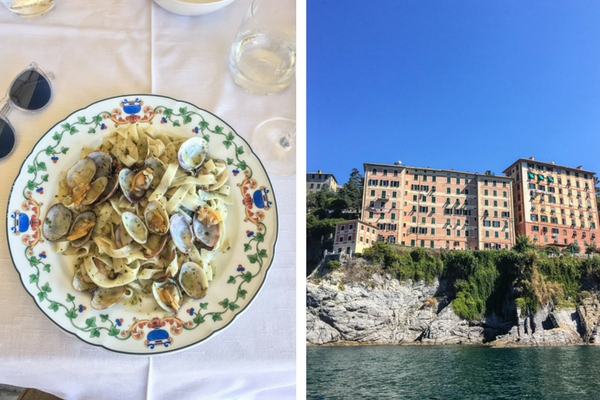 Camogli was beyond charming, untourist-y, and full of must-eats. Pesto for days! 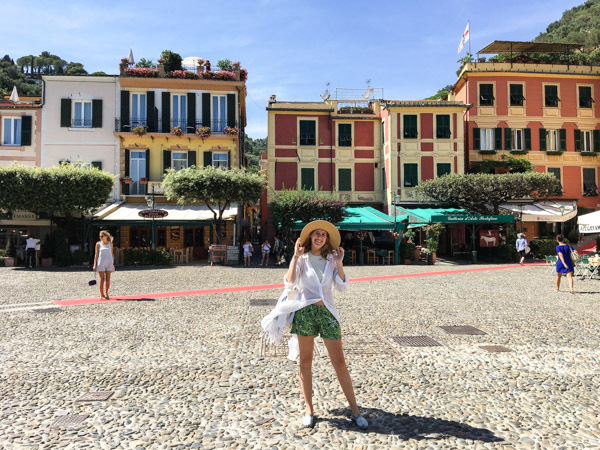 Had we done it all over again, we might have opted to spend more time in Camogli, Portofino and other areas of Genoa rather than Porto Ercole. The landscape was beautiful, but we felt that the Northern coast was less over-run (didn’t overhear a single American there), more charming and full of interesting cuisine. Also, our hotel Villa Rosmarino was a dream. If you go to Camogli and stay there, no need to get my recommendations, Marco will take great care of you. 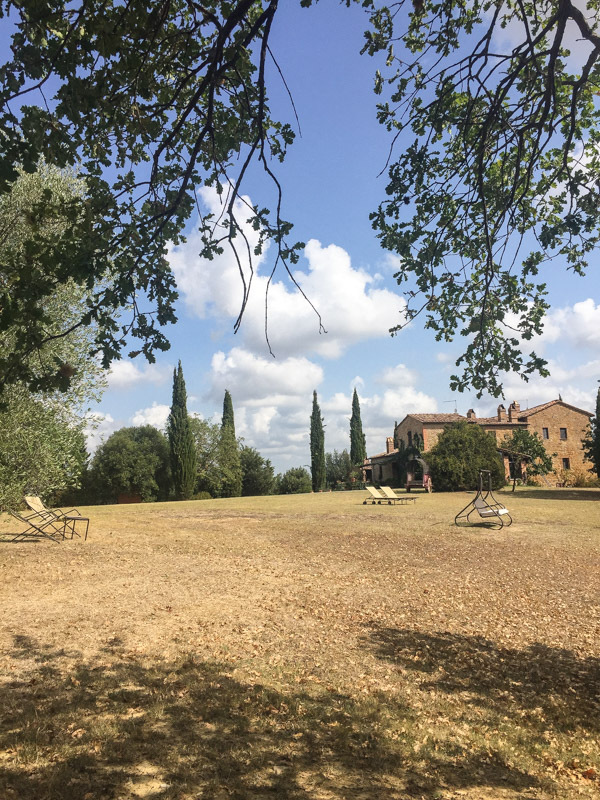 I highly recommend choosing one villa in central Tuscany and using food destinations as a means of exploring all the little hilltop towns scattered throughout the region. 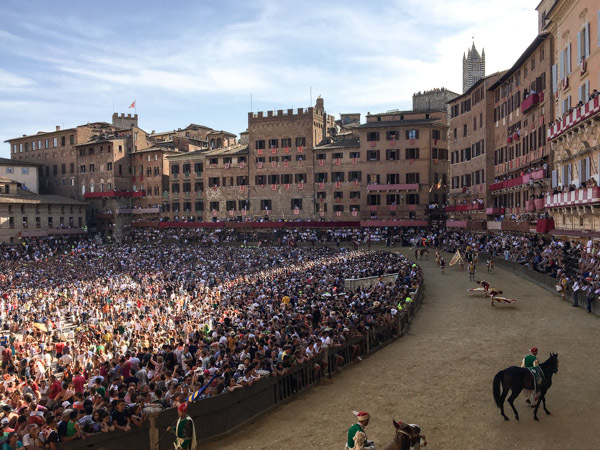 Day 3: Drive to Siena (3 hours), where we attended the Palio in the late afternoon! 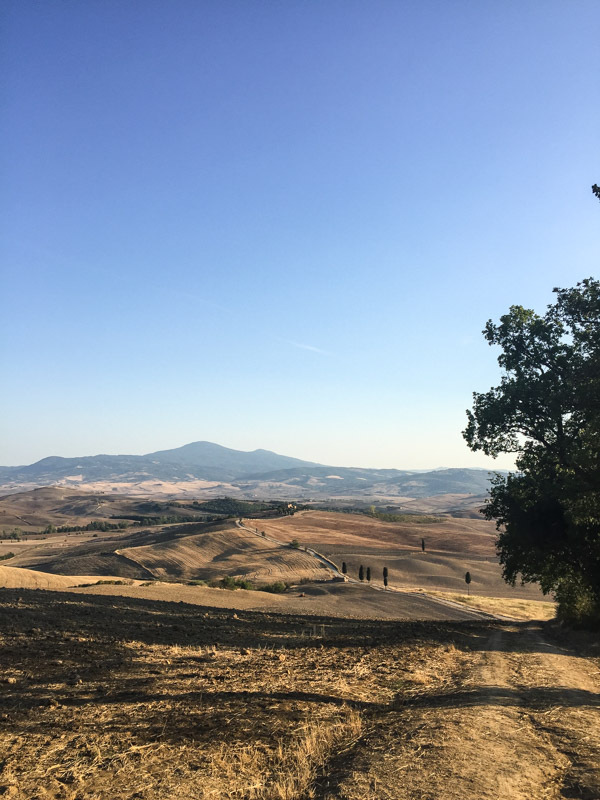 Day 5 – 8: Day trips to Bagni San Filippo, Pienza, Castelmuzio, Trequanda, Multalcino, and various wineries throughout. Our guide who sold us tickets for the Palio also hooked us up with a reservation for dinner afterwards at this upscale restaurant. Being the cynical New Yorker I am, I worried that the owner was a friend of his and it was a tourist trap. We couldn’t have been more pleasantly surprised by the meal. The service was similar in formality and attentiveness to some of the Michelin-starred restaurants we tried. The food was unfussy, though, with a few choice creative twists that elevated it from the usual trattoria fare. Our mind was blown by the asparagus with eggs and truffles. And then blown further when our risotto was finished off in a steaming wheel of pecorino, becoming more and more rich with every stir. The bistecca fiorentina was enough to feed a village, and we ended up taking leftovers with us to our villa in Tuscany, where we had a kitchen. For a nice meal, we felt it was a really good value. We loved the atmosphere at this old school Osteria, where chic Sienese families seemed to have dined for generations. The food was a little pricey for what it was, but we had an excellent lunch of gluten-free pasta in ragu and Vitello Tonnato. The wait staff was very knowledgeable about my dietary restrictions and even took my appetizer back to the kitchen when she saw that they had made a mistake by adding a wheaty garnish. One of the best meals we had in Tuscany, and highly recommended from friends who honeymooned in the region. Le Cose Buone is only a few tables, with a deli counter for antipasti and charcuterie that you can take withyou. The food is simple but so well prepared. Of all the ragus we ate on this trip (and there was many), this was the best. They had GF pasta, but also plenty of simple meat and potato options that would work as well. The server is also the chef, running back and forth to the tiny kitchen, so you know he’s got it all under control! For the longest leg of our trip, we stayed in a converted villa as our home base and did day trips from there. I highly recommend this “agriturismo” strategy if you’re considering a visit to the heart of Tuscany. Many of these old villas have been subdivided to accommodate tourists and are a perfect way to experience more upscale BNB living with plenty of access to the farmland. Our hosts, Isabella and Carlo, run several properties in the area, including this villa which is on the higher end of their offerings. They were perfect tour guides, taking us on sunset walks through the hills, and helping us make the most of the surrounding areas. We were grateful to have access to a kitchenette in the room so we could experience some of the local ingredients at our own hands. Ours was tucked cleverly into a glass doored armoire – one of the coolest small kitchen hacks I’ve ever seen! If you choose to stay there, make good use of the organic garden in back. You can venture out with a pair of kitchen sheers and pick anything you like. We went nuts with the zucchini, eggplant, tomatoes and delicate lettuces. Also, make sure you get their welcome basket, which contains an artfully arranged assortment of local produce, wine, olive oil and ingredients from the family’s working farm in Pienza. Lastly, if you’re not staying on site, I’d definitely consider signing up for Isabella’s weekly pasta-making class (where I learned the art of pici!). It’s followed by a big open-air Tuscan dinner in the courtyard with produce from the garden and Carlo’s specialties from the grill. You can email them through the villa website for more information. 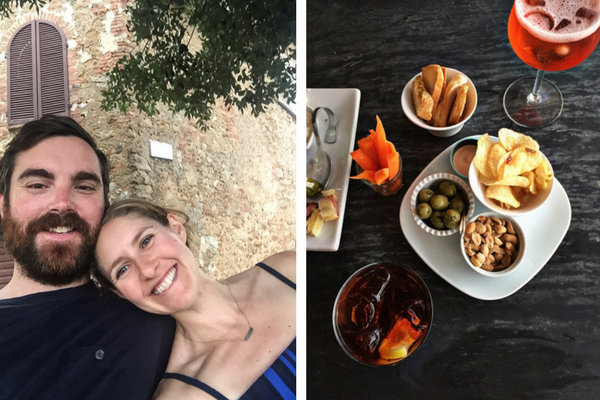 Our time in the heart of Tuscany was mostly spent eating since it was too hot outside to do much else! We’d do breakfast and/or lunch at the villa and then venture out by car for the day, visiting as many small towns as we could. Isabella gives each guest a giant binder that’s her bible of the area, filled with restaurant recommendations that we never would have found otherwise. One of her suggestions brought us to Castelmuzio, an adorable town with less full-time residents than you probably had at your local high school! Tourism is so important for keeping these historic places alive, so we were happy to be able to support the community with our Aperol budget. This casual restaurant is right in the main square of the town. It’s the perfect place to eat delicious ribollita after the sun sets and drink a spritz or two while the church bells ring around you. Both soups on the menu were able to be made gluten-free. They also serve a special white ragu with truffles. Personally, I preferred the tomato-based varieties I tried elsewhere, but the gluten-free fusilli was top notch. The only Michelin-starred place in the area, this white tablecloth hotel restaurant is the perfect venue for a romantic meal or special celebration. Though I found gluten-free pasta options most places in Italy, La Terrazza made their tortellini and gnocchi in house! I wasn’t in love with their interpretation of the latter, but the homemade gluten-free breads were outstanding. As you know, I prefer mom and pop spots to a fancy meal, but the view was fabulous. 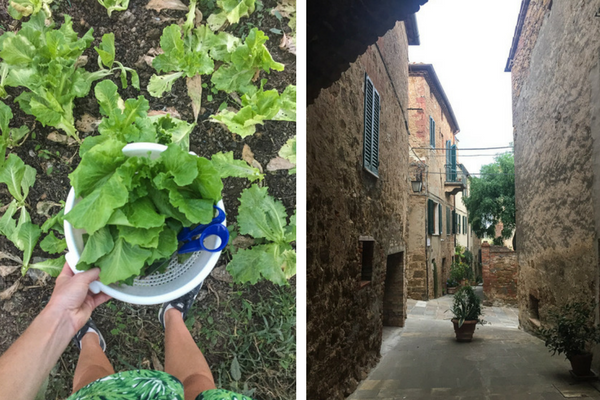 Make sure to go early to walk around Pienza – the whole town smells like pecorino! There’s also a gorgeous little stretch of walkway on the side of the city for a passeggiata! If you follow the GPS to this restaurant, it will spit you out at the top of the town, near it’s walled castle. Park around the lookout point or outside the cafe/bar. 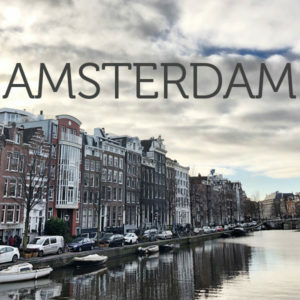 The restaurant is a quick stroll down a few winding cobblestone streets. Where, mind you, it’s so narrow, I wouldn’t want to risk driving anyway. The mother-daughter team behind this local spot are also known for their cook classes. Though clearly a multi-generational affair rooted in tradition, they spend half the year traveling the world and building out their palates. Make sure to try their daily contorni, where you’ll be able to spot some of these influences. Delicate pan-fried Italian eggplant was topped with a subtle Indian-spiced cinnamon and apple paste. And the homemade pici (though not GF) was of course amazing (or so Charlie told me). One of the many magical natural attractions in Tuscany are the hot springs. You can find them all over the countryside, but Bagni di San Filippo was recommended to us as the most astonishing. The Fosso Bianco looks like a manmade waterpark, but exists curtesy of Mother Nature! The main salt formation is nicknamed the “white whale” and looks like a glacier. The walls are surprisingly easy to climb, but water shoes are helpful for the rocky basins at the bottom. During summertime, it’s best to go early in the morning to avoid the crowds. We drove to a nice lunch at Cisterna nel Borgo afterwards, but there’s also a little town at the base of the baths. There are hundreds of wineries around Tuscany, and ultimately we decided to only visit a few. 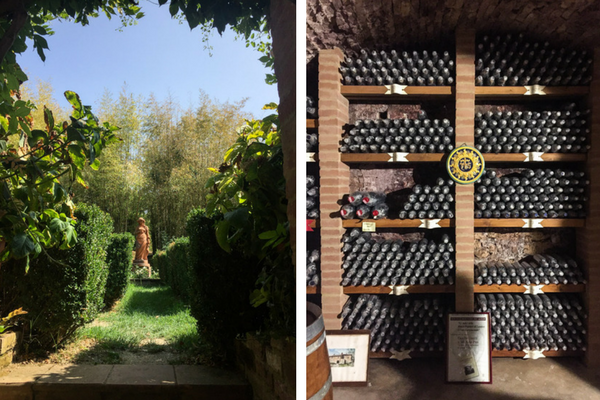 With little to compare the experience to (asides from wineries in the US), we were blown away by the experience at Fattoria Del Colle. First of all, they had me at woman-owned winery. But then I tasted the amazing brunello and was doubly sold. My favorite of the wines was actually their Cinderella label (Cenerentola) that uses a native grape to Tuscany. They’re one of the only vineyards producing it anymore, so the bottle felt extra special and it’s affordably priced. You can walk around the grounds after and I imagine the adjacent Agritourismo is a wonderful place to stay for a few nights. 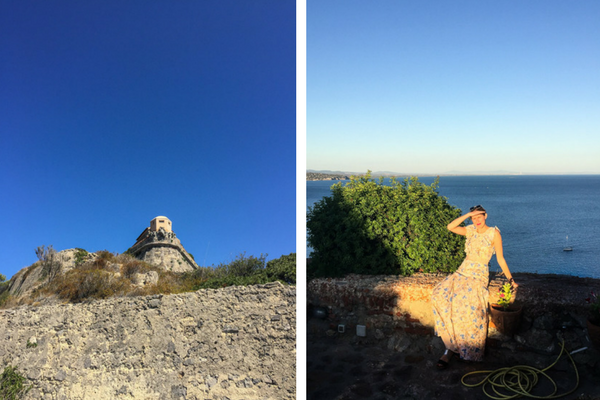 Just 10 minutes from the winery this little town requires a lot of twists and turns to get there, but worth it for the view! We loved our relaxed lunch on the terrace. I took a break from pasta and enjoyed the braised rabbit and contorni of wilted leafy greens. There were many gluten-free options, especially for dessert. 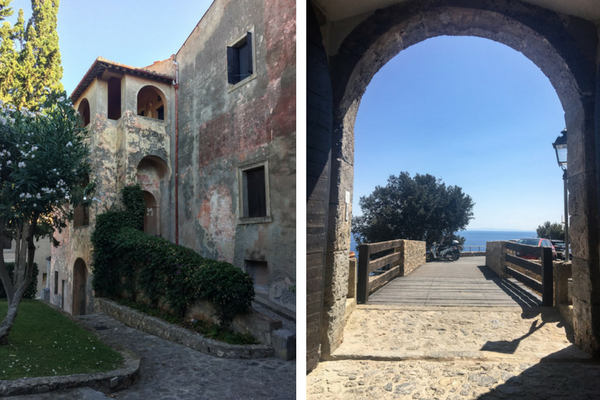 This is the iconic spot in Porto Ercole that draws fancy people from across the globe to its well-manicured cliffs. If you don’t feel like spending upwards of 1K a night to experience the grounds, you can at least go there for a sunset cocktail or dinner. The restaurant has 2 Michelin stars and is a very refined experience, but if you share my food sensibility, you will probably be more at-home at The Grill downstairs, where I watched people eating big pots of mussels and salt-baked fish while I nibbled on foams, emulsions and powders. The best part of the meal was the elaborate variety of homemade gluten-free breads, followed by the squid appetizer and lobster spaghetti. The wine list was a giant book. Like literally, two feet tall. The somm pointed us towards a bottle of white from a nearby island that used a local grape we’d never heard of. It was wonderful. However, we were a bit shocked to find it in a corner enoteca in Orbetello the next day for 12 euro, which means it was almost 6 times the price at the restaurant! That will continue to piss me off. But it gives you a sense of the establishment! As I mentioned in my Rome post, I was thrilled to find so many gluten-free and organic options at gelaterias. 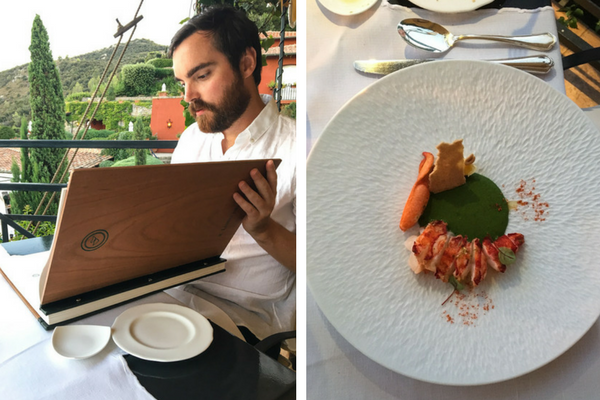 Emiko Davies, who used to live in Porto Ercole, had this place on her fabulous list of local eats. The dark chocolate sorbetto did not disappoint – especially not in a GF cone! 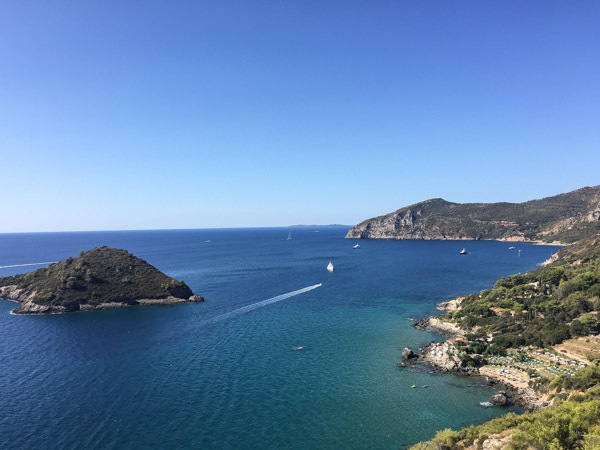 Feniglia is a vast stretch of sandy beach that connects the land mass of Monte Argentario to the rest of the mainland, situated equidistant from Porto Ercole and Orbetello. If you’re having a beach day, this restaurant on the water serves up good quality seafood. Gluten-free tip: ask for the hot seafood antipasti. It’s essentially all the goodies you’d find in a seafood pasta without the noodles, and sadly they don’t have GF pasta there. For more recommendations in the area, make sure to check out Emiko’s guide. 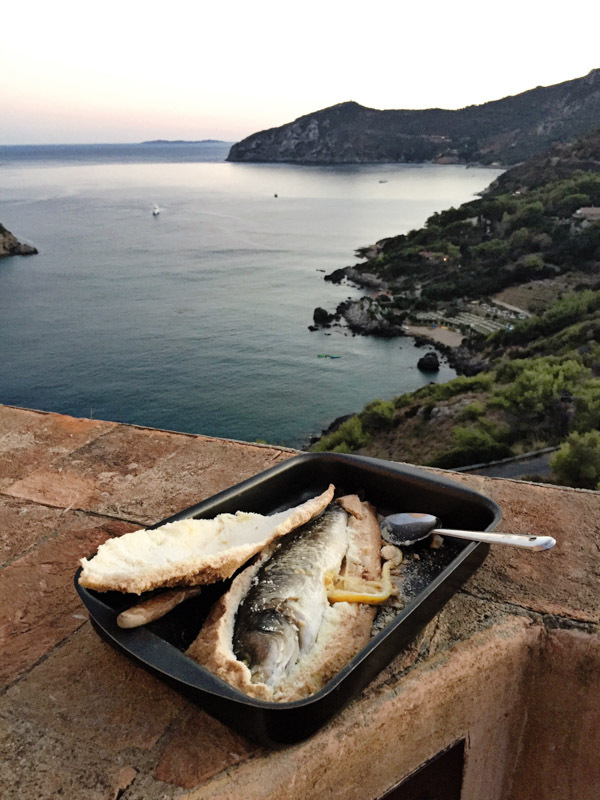 We ended up balancing our 600 percent markup at Il Pellicano with a home-cooked meal on our porch the second night in Porto Ercole, and used her advice on where to buy a whole fish and some veggies. See our salt-baked branzino above! 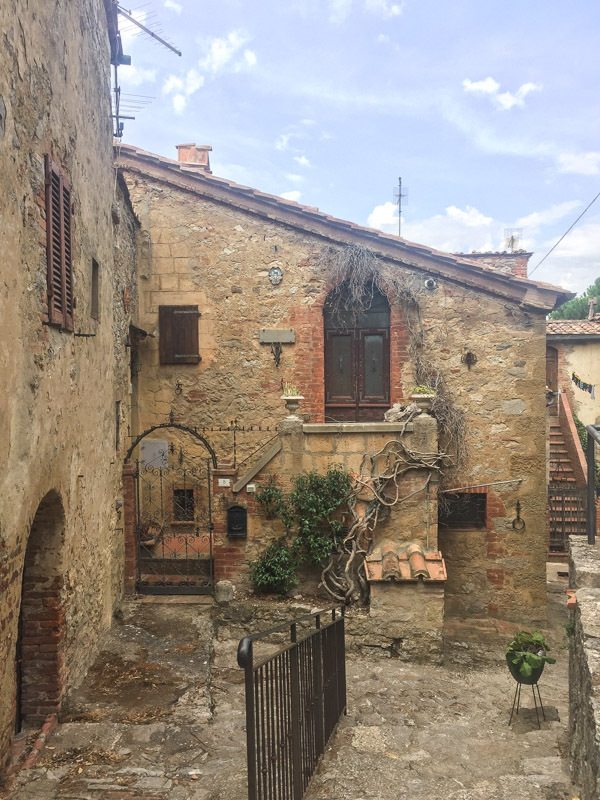 As I mentioned above, our home base for the majority of the trip was Cretaiole, an agriturismo just 10 minutes outside Pienza, and within 90 minutes of Siena, Assisi, Cortona and Orvieto. Picture the hills of Gladiator…because they shot the actual film within walking distance! I would highly recommend any of of The Moricciani family‘s properties – they were wonderful hosts with fantastic style and taste. Another agriturismo we looked at but decided against because we wanted to be more central is Villa Lena. It has an artist residency component and organic farm. If you’re making your way around the area day by day instead of using one central base, it looks like a fabulous option. Fattoria del Colle, the woman-owned winery where we did a fantastic private tasting, also has an agriturismo on the property with two pools, tennis, and many other amenities. 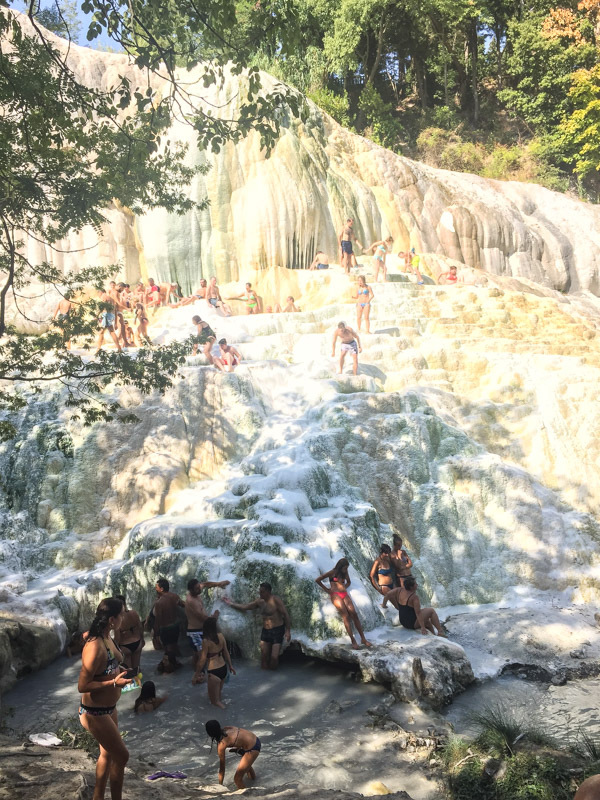 Before we decided on Porto Ercole, we were going to spend a night near the hot springs in Saturnia, which I had spied years ago on someone else’s instagram and made a note to visit. 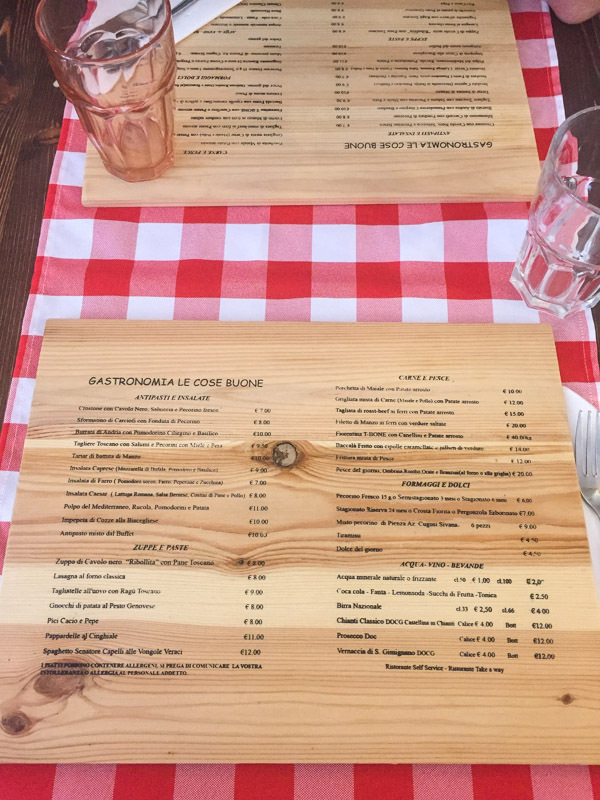 Locanda Rossa came highly recommended in that region, but was slightly out of our price range. Life goals for next trip. 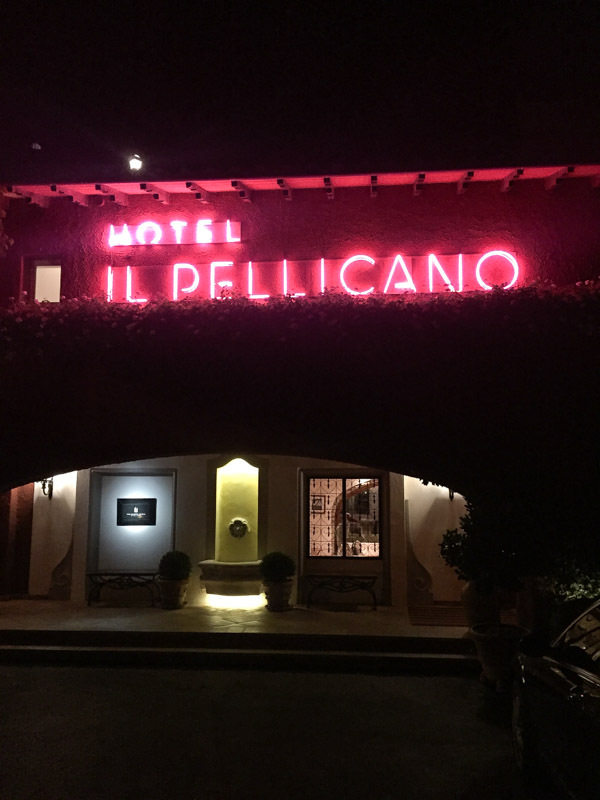 For Porto Ercole, Il Pellicano was obviously out of our price range. Plus, we thought it would be a good location to have an actual home with a kitchen in case dining with the yacht crowd two nights in a row was prohibitive. 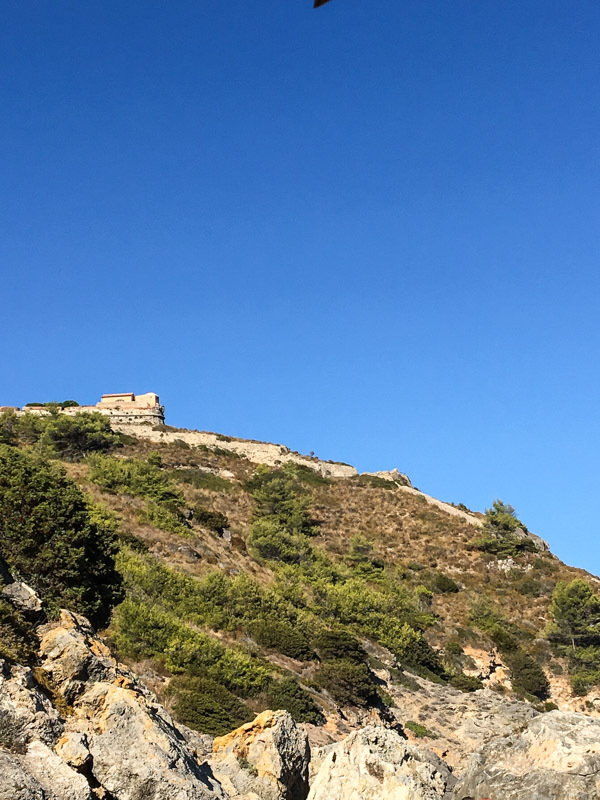 We found the most charming little pink cottage right at the edge of the port, overlooking the surrounding beaches and coves. La Casa Del Faro is situated within the old Spanish fortress, a complex that from the outside looks like a tourist landmark, but has since been converted into a residential complex (capitalism is alive and well in Italy!). The inside of the cottage was pretty dated, and though there was a big kitchen, we were hard-pressed to find anything but a paring knife and one baking dish for cooking. But the views and grounds could not be beat. We loved getting to eat breakfast on the porch and drink a bottle of wine before sunset. And opening the massive gate to enter the property made me feel like I was vacationing in the castle at King’s Landing. Have you traveled around Tuscany? Any cute towns, great hotels or delicious restaurants that I should add to my list for next time? I’m dying to go back! Let me know in the comments section. Did they provide gluten-free flour in your pasta-making class?